Out of a possible 52 meals I ate about 7. The hotel caters mainly for Spanish guests and I am surprised that they ate there. I thought that the food was pretty dire.The only meal that I honestly enjoyed was the sole. Its a good job that its cheap to eat out otherwise I could have lost half my body weight! Hotel wasn't particularly clean. Would quite often find lunch left overs on the floor at dinner time. I gave the food a 2 rating as one of my friends did enjoy some of the food but stay away from the runny mash,its totally bland. The hotel is located on the far side of the beach and does have nice views overlooking the bay from the rear.Sadly however our room was at the front of the hotel which looks onto another hotel. The hotel does have a very small swimming pool. The childrens part is only approximately a 4foot quadrant and the pool size in total is about 25 foot by 20 foot and is quite steep,going from roughly 3 foot to 7 foot deep. Towards the back of the hotel (pool and beach side)there are 48 steps (we counted them)between the hotel door and the pool so I would not recommend this hotel if anyone has walking difficulties or young children. Also the surrounding pavements are quite slippery even when dry.Saw quite a few people slip over. Gave entertainment a 3 but did not see any as went out every night. Hotel staff were friendly enough except in resteraunt. The highlight though was the night porter,who no matter what time of the morning we rolled in always welcomed us with a smile and a card trick. This guy is so good he should be on the telly. To summarise,I dont think this hotel is very child or elderly friendly due to the amount of steps and poor pool. If you just want somewhere to crash and buy your own food then go for it. Oh nearly forgot,they allow dogs in the hotel and by the pool. Didnt hear any barking but dogs do need the loo.You decide. I really don't understand the precedent comments. 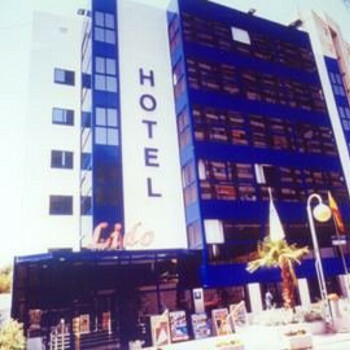 I use to go to Benidorm for long years and even though I normally rent a flat, last year I went to Lido. Food was excellent (apparently english people only like english food !!) and staff was rather cool. This known as I speak spanish fluently so it's easier to make you understand ! The hotel was clean but I must admit entertainment was something I will call 'boring' rather than 'entertainment'. Better to go outside for your evenings. I'll be back in 3 weeks. Come with me !!!!!! The food was terrible, It was the same nearly every night. Restaurant staff didnt want to be there, Bar staff was the best but the Restaurant staff let the hotel down along with the food. Reception staff okay english woman working there new some english couldn't understand spainish writing on the checking cards but didnt seem to want to help. Overall woundn't stay there again.